Barely four months into the new year, the list of crypto exchanges that have been breached keeps growing. 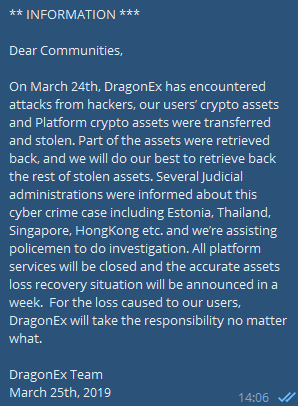 DragonEx is the latest major crypto exchange to suffer this fate according to an official post made earlier today. Cryptoline News has tried to reach the DragonEX team for further comments on the situation but as of press time, we are yet to get a response. It is also not entirely clear the extent of the damage as this has also not yet been specified by the exchange and we will have to wait for a response from the platform. This hack comes just two months after another major exchange, Cryptopia was breached with the hackers managing to get away with tokens worth $3.2 million at the time. Just like it has become custom these days, Cryptopia initially told its users that it was undergoing unscheduled maintenance and even issued several updates before reporting the incident. What’s your take on DragonEX, the latest major crypto exchange to fall victim to hackers? Share your thoughts in the comment section below.